I’ve been a glove girl for years, but I’m ready for a change. Mittens are on my “Must Knit” list this winter because they’re warmer, easier to slip on and tend to be more colorful – so I can easily spot the one that inevitably falls out of my pocket in a dark parking lot! 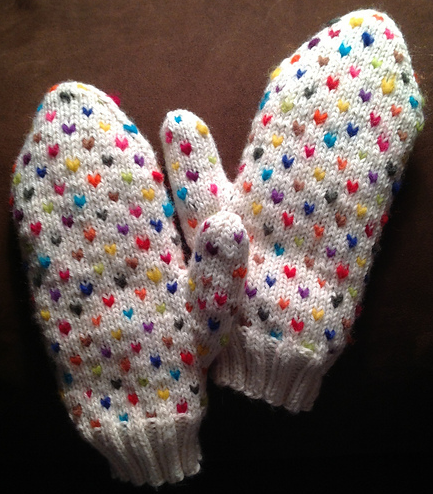 I started looking for knitted mitten patterns a few weeks ago and I’m really excited by what I found. If you’re snowed in this weekend, it might be the perfect project. Here are a few of my favorites that others have made with Berroco yarn! 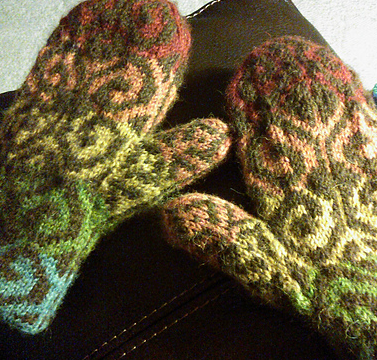 I think these Thrummed Mittens might be the first pair I cast on. The pattern claims they’re the “warmest and coziest mittens ever” and I believe it. Plus, they’re really cute! Raveler April2x4 made hers in our Vintage yarn with beautiful multi-colored thrums. Apparently, they’re also a quick knit. It only took her two days to finish! As someone who uses the “Roy G. Biv” acronym to color-code her closet, I really appreciate the spectrum of colors raveler knitiekatie chose for her Fiddlehead Rainbow mittens. She used six shades of Berroco Ultra Alpaca and Berroco Ultra Alpaca Light to achieve the rainbow effect. Next article Norah’s Knits: Aquarium of the Pacific – Future sweaters?